"Throughout our history we don't mind that people become rich but we do mind that people become powerful. Standard Oil had the first real problem with that among public companies." Rockefeller's empire became, says Mr. Smith (no relation), "a proxy for everything that Americans feared—and what they feared was a concentration of power." A straw poll by Fred Bateman, a professor of economics at the University of Georgia's Terry College of Business, brings us to the present. He asked three classes in economics, about 100 students in all, which company they thought was the most hated in America. They almost all said Wal-Mart. And, in its darker moments, Wal-Mart might almost half-agree. For the past two or three years it has endured spikes of public hostility provoked by labour unions that want to organise in its stores, communities that want to shut it out to safeguard local commerce, and by periodic rows over claims that Wal-Mart was using illegal immigrants as cleaners, paying its staff so little that they relied on welfare benefits, and systematically underpaying female workers. Having tried at first to stare down its critics, Wal-Mart has moved in the past year to recruit a high-powered team of lobbyists and consultants, including former advisers to Ronald Reagan and Bill Clinton, to manage its image and interests more actively. You gotta love any company which so blatantly attempts to mask its essential uncaring character with the phoniest of hired-gun marketing. The technique is as well-worn as Wal-Mart's slogan "lowest prices, always": spread a thick layer of schmaltz over the entire nation's media, and keep spreading it until people start accepting it as truth. My good friend Gary Baker claims that repetition alone can change consumers' minds. Never mind if the claims ("Wal-Mart cares about your community," etc.) are unsubstantiated fabrications; if you repeat the B.S. often enough, people will start believing it. 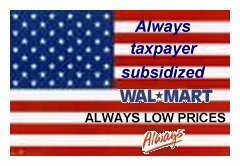 Based on Wal-Mart's campaign to reshape its image as the most evil, hated company in America, I'm recommending to my sponsors (Kroika Cookie & Biscuit Company) that they begin a blanket media buy of this simple ad. Never mind that both statements are obvious lies; Lord only knows what's in a Kroika cookie, but it certainly isn't a health-food product. And since it's made entirely in China, then it's eating away (sorry about that bad pun) at American manufacturers of cookies--just like 99% of the shoddy products Wal-Mart sells that are made in China. 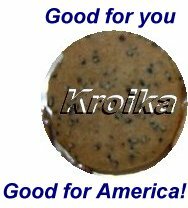 Just like Wal-Mart, Kroika can undersell any American-made cookie, and just like Wal-Mart, no one ever figures out the true costs of those "lowest prices, always." A good place to start your calculations might be the 2.353 million drop in U.S. production workers since 2000, and the hollowing-out of most American town centers by the behemoth Wal-Marts which are always located on the cheap-land fringe of town. This insures a lengthy commute for all area residents and the decimation of local retailers. But have at it, Wal-Mart; since Reagan's and Clinton's handlers did such a brilliant job of pulling their boss's chestnuts out of the fire (can you say Iran-Contra and Monica whats-her-name? ), then they will undoubtedly succeed in transforming Wal-Mart from the Devil's favorite retailer to the schmaltzy heart of America's decline, oops, I mean greatness. copyright © 2005 Charles Hugh Smith. All rights reserved in all media.